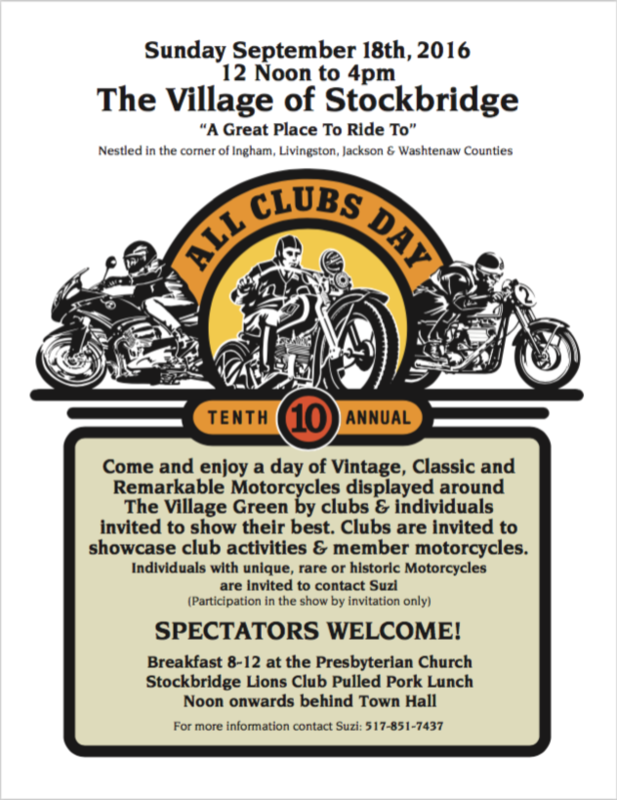 Annual Stockbridge All Clubs Day!! - Sunday, September 18, 2016, noon-4pm. This is the classic bike show everybody looks forward to! We usually meet up on the South side of the town square around noon,. It's also a beautiful area to ride in, including the Waterloo and Pinckney State Recreation Areas! You won't want to miss it! I'll hang out for a while, and will walk around the show for a bit - but I'm there to ride too I'll be on my red Yamaha Super Tenere along with a friend on a BMW GS Adventure bike. If you want to contact me by cell - send a PM and I'll reply with it. Well...........I'm in............IF.........I don't have to be at the shop.... I'll know the wknd schedule by tomorrow(wednesday) afternoon. Would be up for some breakfast during the ride out there...Maybe that place in Milford or South Lyon?????? Looking forward to seeing you Richard!! Dean - you have my cell - call me and Chris and I will hook up with you if we're still down in the area. We're planning on doing a bit of adventure riding in the recreation areas. I might be there, even if it means being the only COGger actually riding a Concours. Heh heh! I still have my Connie Glenn - in fact I'm riding it out to Lucky's Steakhouse tonight!!! Planning to be there - probably won't arrive until 1:30 - 2:00. Be good to see you Stanford!!! Ya and we won't hold lunch for you. I am thinking of buying. Great ride yesterday!! Good to see many of you, sorry I missed a few of you. I got home about 7pm - had a GREAT day of riding! The weather was PERRRFECT! !